Strategic Planning – the process of assessing the issues and developing a vision and overall strategy toward success. Strategy Clarification – the process and tools to clarify and simplify a strategy so that it can be best communicated, translated and aligned across an organization. Strategy Deployment – the approach to cascading a strategy to units, departments, functions and teams. Operational Planning – the process and method for development operating business plans to determine product and service offerings and resource allocations. Personal Goal Planning – the process and tools required to align individuals to their most closely associated strategic objectives and strategic initiatives within their own annual performance goals and appraisal model. Financial Budgeting and Planning – the process of developing a budget that aligns to and drives both strategic and operational needs. Process Execution – the activities within an organization that occur via processes or projects that require effectiveness and efficiency. Process and Operational Reviews – the standardized and frequent review of process performance and project progress to ensure timely, on-budget and quality delivery. 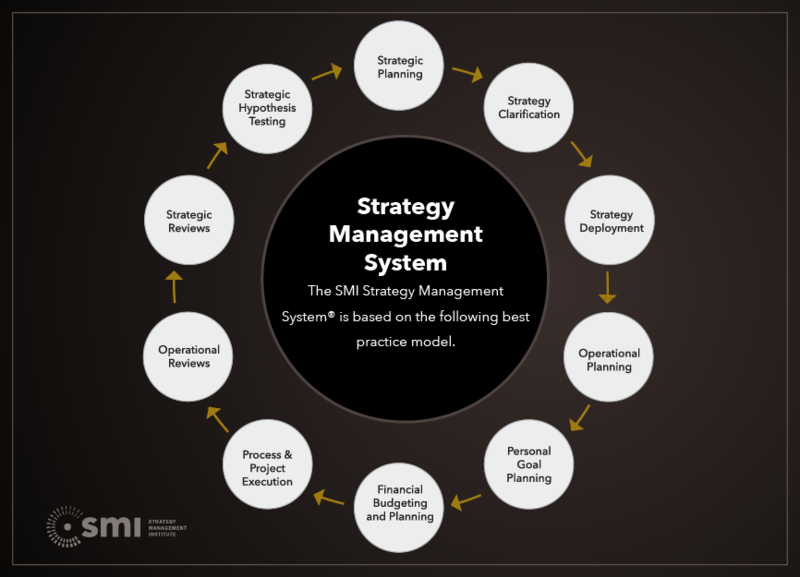 Strategic reviews – the standardized and periodic review of strategic objectives to drive focus an accountability to ensure progress toward targets and the activity of driving initiatives. Strategy Hypothesis Testing – the annual or less frequent testing of the strategic hypothesis to then drive the refresh of a strategic plan.